Our Christmas tree is full of beautiful keepsakes and reminders of the years from the past. There is nothing more special to me as a parent to be able to look at ornaments from 3-4 years ago and remind me of how little my kids were. They grow up so fast, that I want to make sure that I preserve every moment I can. I feel the same way about my pets too. Since my husband and I have been married we have owned 7 dogs as various times. We loved all of these dogs the same and have found memories of them sitting around the Christmas tree, watching us open gifts. This year I wanted to do something special with my two dogs, Abby and Willow to help them have their forever mark on our tree. My two kids have handprint ornaments so I figured why not have a few ornaments of our dogs paw prints. So we made a few DIY Dog Paw Print Ornament Keepsakes. The first thing you want to do is mix your salt, flour and water together in a bowl. Once completely mixed knead the dough for a good 60 seconds. 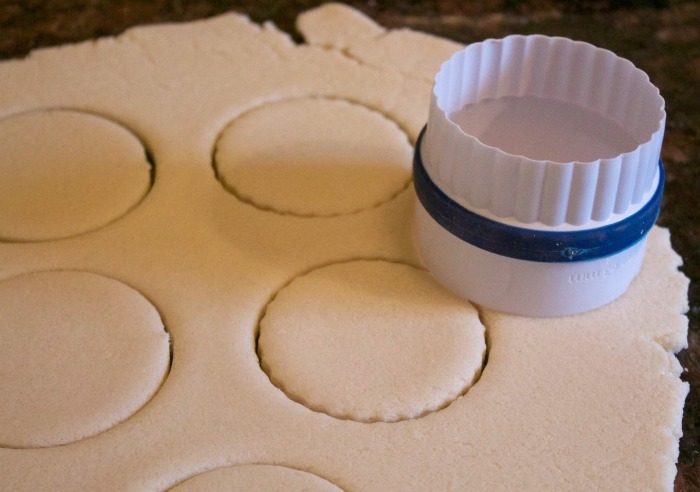 Next on a flat surface roll out your dough. 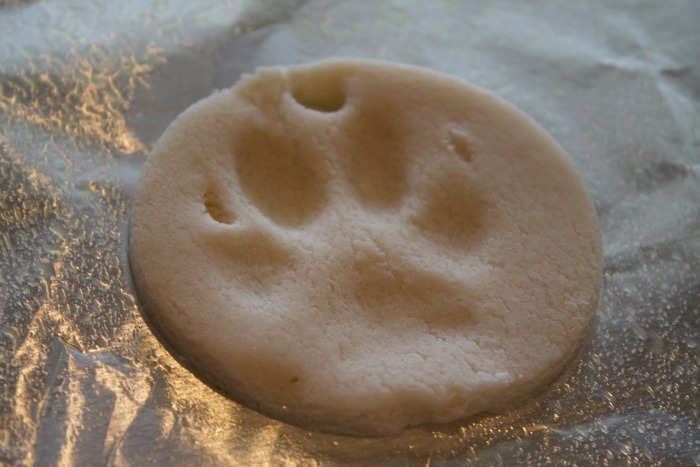 Then with a cookie cutter, cup, or biscuit cutter make a circle shape large enough for your dogs paw print. After you have made all your ornaments poke a small hole at the top of your ornament to lace the ribbon through. 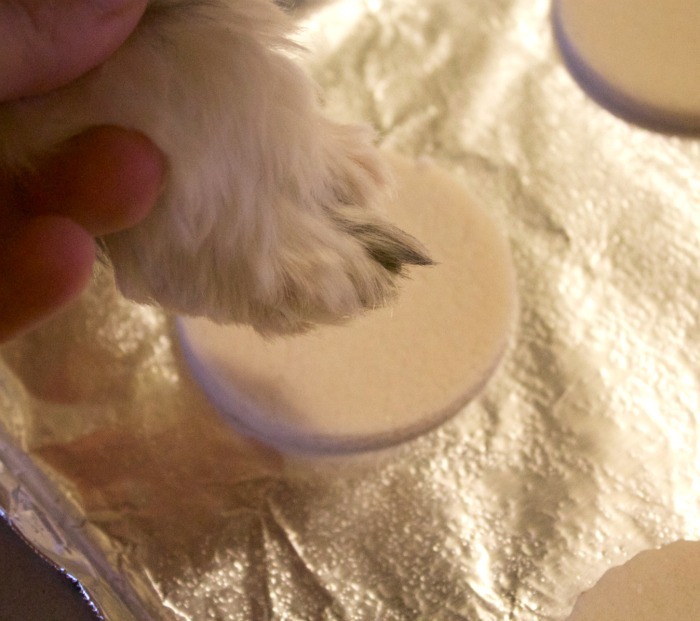 In a preheated 200 degree oven, place your dog paw print ornaments inside and bake for 2-3 hours or until the ornaments are completely dry. Let the ornament completely cool and then run a small ribbon through the hole and tie it at the top. Make sure you have a big enough hole to hang on your tree. 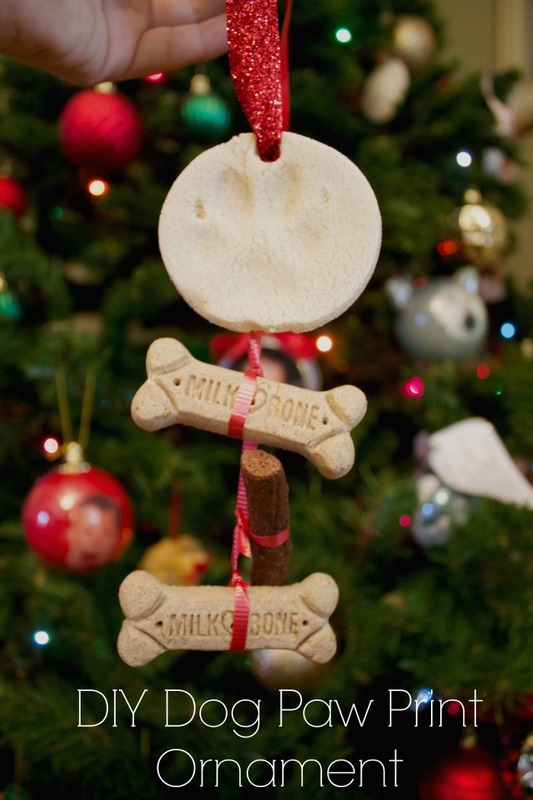 Next tie a few Milk-Bone treats to the bottom of the dog paw print ornament such as Milk-Bone bones and Pup-Peroni treats. 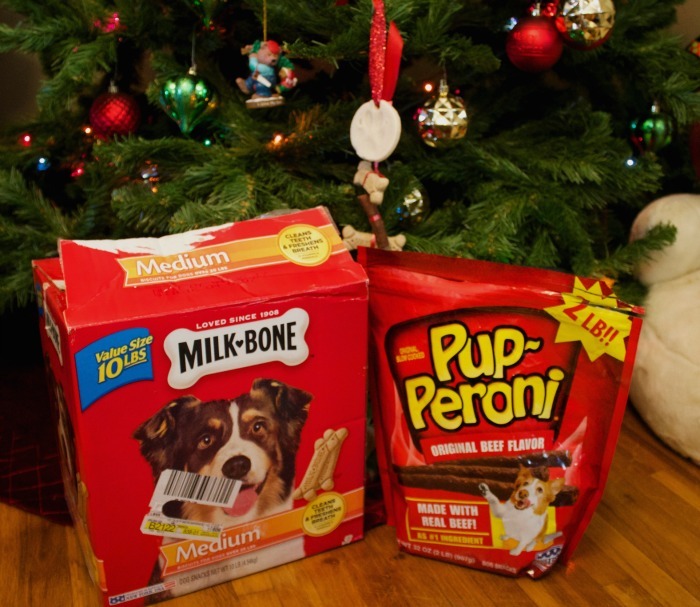 I like to add these two treats because not only are they a favorite with my dogs but they are wholesome and delicious treats that I feel good about giving. 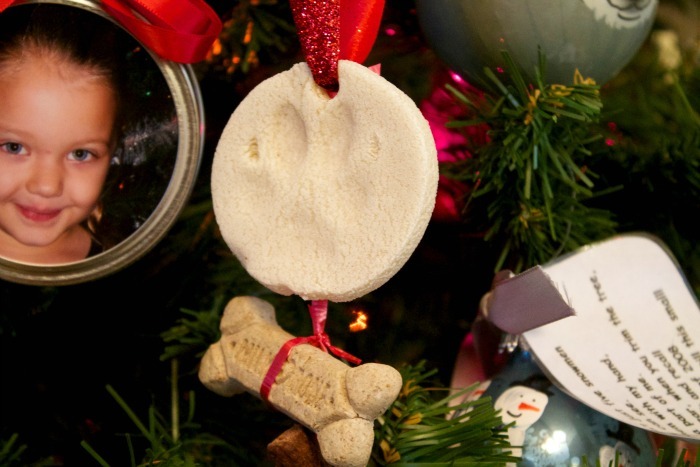 These cute DIY Dog paw print ornaments are so fun to make and will make sure that you capture that special holiday memory of your favorite pooch for years to come. 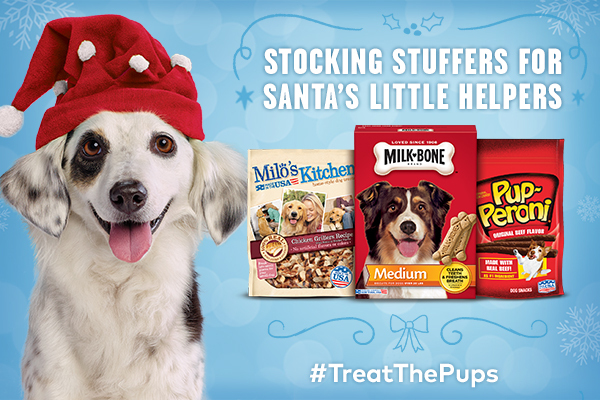 For more fun holiday treat ideas for your furry friends be sure to visit the Big Heart Pet Brands #TreatThePups page at Walmart.com. They have some super cute ideas including a dog treat wreath and gingerbread house just for your dog!